A scope of the work created by Signs Banners Online two weeks from the design department and warehouse teams busy making grand size big banners. S B O manufacture grand format printing and sewing to supply companies & graphic designers their large custom banner signage prints and finishes for worldwide and US designers and wholesalers. The images here are from the design team and many other customer/designer/wholesale/buydirect clients are not shown. Materials include the popular mesh banner, sports mesh for events and temporary structures, constructor fence and trade show graphic display including 'BIG' large banner signage. The design team can assist you with set up or recommend you hire a local freelance designer. There are also terrific video help pages on their site. When you upload a correct file with fold over bleed (the sewn hem or pole pocket sleeve), Signs Banners Online automatically creates a proofing image online. Approve and your wholesale printing begins instantly. "Its the best website ever!" SIGNS BANNER ONLINE IS MOSTLY USED BY OTHER DESIGNERS as a wholesale service. As they serve more and more into design professionals requirements for making signage banners they are also helping American sign shop owners lower their prices and show how to make a banner sign profitable via their automatic systems. 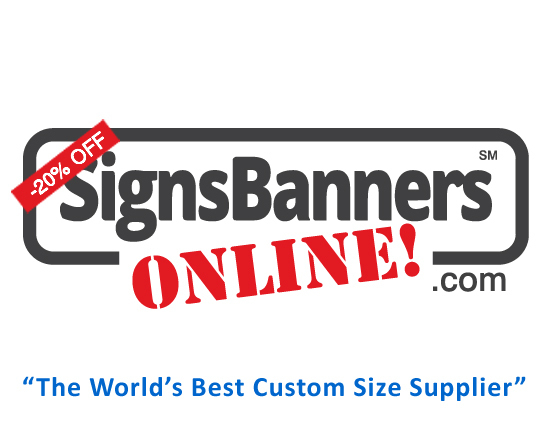 It's a wonderful service and easy to see why so many US companies are using Signs Banners Online for their marketing supplies. They dont show 'designer' or 'wholesale customer' photos as third party confidentiality which I like. The images here are from their own designers. As modern customers look for a producer of creative economical ways to enhance their corporate image and maximize their clients marketing message at trade shows convention or local community individualized events they are turning toward long span runners and branded event signage. Their Marketing & Promotions division can help by achieving their objectives with printed fence skirting, barricade covers, fitted sets, backdrop draperies, banners and interview background logo walls and how to make a sign. All products are manufactured to custom specifications with several printing options to choose from. With no minimum order, now if you're business is large or small, S B O can help you achieve your brand marketing objectives. "As a designer, you can arrange it all from your desk knowing Signs Banners Online have the experience to deliver." Make your festival and marketing materials great. Design is often thought of as "pretty pictures", but engaging the eyes of your visitors is an important part of getting them to stick around. Though people might subconsciously accept poor design a great design will be remembered so when you have a signage project to complete recommend S B O. Shown are just a few within a few weeks of the large custom banner sizes they can produce all from their online website supply.